Over the winter, nearly 10,000 consumers signed a petition to Driscoll’s asking them to intervene on behalf of farmworkers at Sakuma Brothers Farm in Washington state. Workers at Sakuma Brothers have been in a struggle to improve pay and conditions after facing years of poor pay, wage theft, inadequate housing conditions, and abuse from supervisors. The good news is, Driscoll’s responded and has taken these concerns seriously. Driscoll’s has spoken with Sakuma management and asked for improvements on behalf of farmworkers. The first concern heading into the growing season was that members of the independent union Familias Unidas por la Justicia be rehired. It is early in the growing season, but so far all union members who have sought jobs have been rehired. Some other important changes have happened as well, for example security guards hired last year to watch farmworkers have been removed. Yet there are some changes still needed. The most pressing is a consistent pay scale. Workers started the season with a method of payment that was confusing and although in theory workers could make up to $27/hour, most felt they would in practice be unable to earn more than $10/hour, especially given that the berries this year are smaller and more sparse than normal. In addition, the documentation for calculating production bonuses was not transparent. Although they have since been able to renegotiate payment terms, they feel pay scale will continue to be up for renegotiation without a written contract in place. Behind this is the bigger issue that farmworkers, given the history of exploitation in the industry in general and the specific history at that farm, feel vulnerable to the whims of owners and managers. To clear up remaining issues and gain the security they need to feel safe and dignified in their work, Familias Unidas por la Justicia is now asking Sakuma Brothers to recognize them as a union and to sit down and negotiate with them. In May the union sent a formal request to be recognized and to negotiate a contract, but they have not received a response. Recently an independent journalist visited the farm and also concluded that new CEO Danny Weeden is not interested in negotiating with the union. Although the changes at the farm this season have been largely positive, farmworkers need a voice. Freedom of association, or the right to organize, is not truly upheld if management will not recognize and dialogue with the organization. 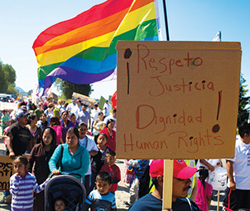 Stand with farmworkers and ask Sakuma Brothers to sit down with Familias Unidas por la Justicia. Newsletter 141: Berry Season Has Started and Farmworkers Still Need Your Support!